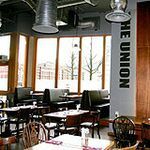 The Union Bar and Grill offers an impressive range of quality beers, wines and spirits that complement the food perfectly. Do you work at The Union? Twenty outdoor tables in and around some beautiful leafy trees with large outdoor umbrellas and heaters. What did you think of The Union? Been coming here for a few years now - been a bit topsy turvey over the years but they seem to have got new management in over the last 6 months or so. I went in last week and the staff were all really friendly and happy - rare by itself - service was fast and friendly too. Ordered the Duck Breast and was really amazed at the quality and presentation and my friend ordered the burger which she said was great. Overall I'm really glad they've sorted things, had a really lovely evening. Music was pretty good too - not too many places you'll hear latest singles from someone so obscure (but good!) as Passionpit or Gabby Young! Fancy a tasty meal in a tranquil setting? It might not be the ideal location but the grub certainly makes an impression. Unless you work in the corporate area of Sheldon Square in Paddington, you'll probably have some difficulty in finding this bar. The area it sits in was recently disused land and, although The Union has been running for three years, the location is still not listed on a map. However, if you're brave enough to head along with just a rough idea of its situation then you’ll find it's not that bad in reality – there are signs directing you from Paddington tube station and it's only a five minute walk. Once you've found it, you'll be surprised by how relaxed the environment surrounding it is. Whilst it's situated in the new Paddington Waterside Development, it's positioned right on the Grand Union Canal, which makes the setting rather relaxed. From the outside, the building looks like a standard clean-looking, modern venue with huge panels of glass and a seating area for smokers or those wanting to look out over the canal. Inside, it has an edgier look: you've got a large industrial-style bar at the back, a dark wooden floor, huge amount of seating on both decent-sized booths and tables, and exposed piping on the ceiling, which gives the place a trendy warehouse feel. You'd expect The Union to have a pretentious corporate feel to it, but surprisingly it doesn't. Due to its location, most people in the bar are from the adjacent offices, but it's not unwelcoming to those not in a suit. Staff are cheery, relaxed, chatty and really attentive, and whether or not this is down to the fact they're trying to attract business types who stereotypically have a lot of cash, it's never bad to have service with a smile. Monday-Wednesday you'll find it easier to find a table and on Thursdays and Fridays the place fills with business types ready to start their weekend with a drink or five. 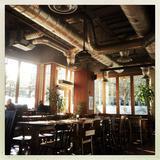 At the weekend, the bar attracts locals who live in Paddington. The Union offers a typical menu for a bar – you've got English favourites plus a few popular dishes from around the world. Whilst the selection is good, they could offer a few more exciting vegetarian dishes. Presentation in this restaurant is exquisite and dishes are a fantastic size – not so big that you're left feeling uncomfortable and not pretentious and small. Starters are priced from £3.75 for the soup of the day and homemade bread and go up to £6.95 for a Spanish and Italian Charcuterie with homemade bread. The asparagus and roasted butternut squash with warm new potatoes and truffle oil salad (£5.70) really stands out. The fleshy green asparagus stalks are tender but not too soft and the warm new potatoes melt in your mouth. The truffle oil adds a great flavour and aroma to the dish. The poached smoked haddock Welsh rarebit with cherry tomatoes and toasted brioche (£6.50) is a delicious dish for fans of fish. 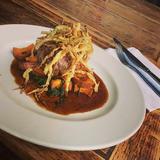 Main courses start at £8.95 for a penne pasta dish and go up to £16.50 for a rib eye steak. Vegetarians aren't well catered for with only two meat-free pasta dishes available. Saying that, the rocket and ricotta ravioli with spinach, white wine, cream and mushroom sauce (£9.75) is delicious. The ravioli is cooked well, but isn't over soft and the heap of fresh cooked spinach is streamed so it tastes wholesome. The white wine, cream and mushroom sauce isn't too rich, just satisfyingly creamy. Whilst the menu is predominantly full of English favourites and a couple of popular Italian dishes, this bar has recognised the popularity of Oriental-inspired dishes, too, such as the red Thai chicken curry with cashew kernels and fragrant jasmine rice or noodles (£9.95). The dish looks fantastic – the rice is in a perfect mound and the curry is displayed with a giant chilli over it. Whilst the base of the curry is nicely thick, it's not overwhelmingly rich. The green salad (£3.95) is a reasonably priced side dish for most of the meals on the menu. This is a unique dish made of rocket, green beans, spinach leaves and moon-shaped cucumber pieces on the side. It's a raw dish and not oily, so you can season and dress to your taste. Desserts cost from £4.25 for a selection of homemade ice cream and go up to £6.95 for a trio of Italian cheese with honey and biscuits. The apple and cinnamon crumble is a tasty treat – the crumble is satisfyingly sweet and the cinnamon adds an extra kick to the dish. The apples are in generous chunks and the dish is not too stodgy, so you can stomach it after a couple of courses. The trio of Italian cheeses with honey and biscuits is a good savory option if you're not keen on traditional English puddings. The cheese selection could be wider, but the sharp and salty blue cheese makes the dish worth ordering. The accompanying crackers are a little dry and may not be to everyone's taste, but a slither of honey greatly improves the flavour. 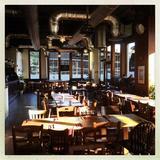 The Union also offers a tapas menu (priced £3.50-£3.75), which caters for the after-work crowd. The pan fried halloumi with red peppers is made up of three halloumi pieces grilled with a nice texture and doesn't taste too salty. The grilled quesadilla with sour cream (3.50) is a generous portion for a tapas dish and the combination of vegetables and stringy, melted cheese tastes amazing. There's also an all day snack menu and a brunch menu available. The Union has a great drink selection. The wine menu is extensive and caters well for the corporate crowd. Prices start at £13.50 for a bottle of house wine and go up to £48 for a bottle of Laurent Perrier Brut Champagne. Glasses of house wine are priced from £3.50. The Alpha Zeta Pinot Grigo (£18 a bottle) is light, easy to drink and complements most dishes on the menu. There's a good selection of coffees and after dinner drinks on the menu. 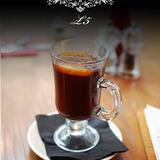 Coffees cost around £2 a cup and £3.50 for liquor coffees. The Cockburn's port (£4.50 for 125ml glass) is sweet and mellow and goes really well with the cheese board after the meal. If you're visiting for just drinks, you'll find a good selection of cocktails and shots – the B52 shooter stands out. The Baileys and Grand Marnier are so neatly layered you almost feel it's a waste to knock it back. Corporate and bizarrely located, The Union is definitely worth going out of your way to visit.